Until the 90s, Potassium Sodium Tartrate was divided into two types: Natural and Synthetic. it is more properly known as L+ Potassium Sodium Tartrate. It is tipical for natural products -if there is the possibility to be optically active- to be available in only one of the optically active forms. Synthetic was the product obtained by synthesis using reactives obtained as derivatives of the oil industry: chemical reaction between maleic anhydride and hydrogen peroxide to obtain racemic tartaric acid and then turn it in its racemic salts: This product is not able to rotate a beam of polarized light because it is a mixture of 50% of L+ Potassium Sodium Tartrate and 50% of D-Potassium Sodium Tartrate (where one rotates the light to the right, and the other to the left: so in the 50/50 mix the light does not rotate). It is typical for industrial chemical reactions to be not stereoselective, and to obtain the formation of optically inactive products called racemates. The two components of this mixture are not separable by physical methods as filtration, distillation etc. The consequence is that Natural and Synthetic product are easily recognizable one by the other with a simple and cheap instrument: the polarimeter. This often causes confusion among non-professionals, and sometimes even among professionals! How can you distinguish the “real” natural product by the synthetic origin one as they have the same chemical formula? Why the natural origin product should be preferred to the syntetic one? Today when we are speaking about tartrates we say “natural product wine origin” to make clear it is produced by a natural process, obtained naturally as a secondary product during the wine production process, the other product should be called “natural product by synthetic origin” to clarify that even if it is called “natural” it is produced by a synthetic process. Analytically there are no recognized, easy and cheap methods to distinguish the natural product wine origin by the natural product by synthetic origin, except the Carbon 14 method, but it is extremely expensive. Which is the difference for the final user? The two products seem to be exactly the same! It is better to pay attention at this problem right now, specially if the product is for food use (but also for technical use you must be very careful); the purity limits for this product are imposed by law considering the process used for the production: they are focused to keep under control the typical impurity of the production process… But if the product is obtained by a different process, the impurity to keep under control should be different (catalyst, or traces of unexpected reactive for example), so it will be logical to have limits for the impurity used in the synthetic process, and not to check the typical impurities of the natural process: this is the reason the producer and the seller should declare very clearly the origin of their product. At the moment for the law (Europe and USA) exist only one product (the wine origin one), and when you will check for the impurity of the natural wine origin product on the synthetic origin product you will find it without impurity: but this happen only because you are looking for the wrong one. But nobody knows which could be exactly the impurities of the synthetic product, and this is alarming if we consider that we are using it in food preparation without any idea of which could be the health problem at medium or long term. 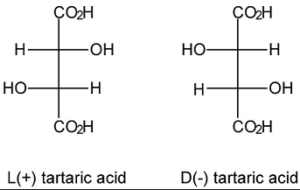 The tartaric acid historically has considerable importance because since the origin of chemistry (already had been isolated in 800 after Christ by the alchemist Jabir ibn Hayyan) was known as one of the few acids available in the solid state, with all the practical benefits that at the time this implied. Potassium Sodium Tartrate was prepared for the first time, around in 1675, by the French chemist Pierre Rochelle, in honor of which it is still known with one of its synonyms: “Rochelle salt”; but this salt is also known (especially in the Anglo-Saxon world) with another synonym: Rochelle salt, in honor of the French town of La Rochelle, where Dr. Seignette produced it for the first time. In 1847 Luis Pasteur, continuing the Jean Baptiste Biot studies on the power of this salt to rotate a beam of polarized light, was able to separate by hand (crystal by crystal) a racemic mixture of this substance: this was the first time a racemic mixture of two enantiomers had been separated. In the preparation of the cigarette paper as the combustion controller. In plaster and cement industry as regulator for setting time and for the control of the final volume. In the Fehling reative preparation. In the Biuret reactive preparation. Other special packing available on demand.